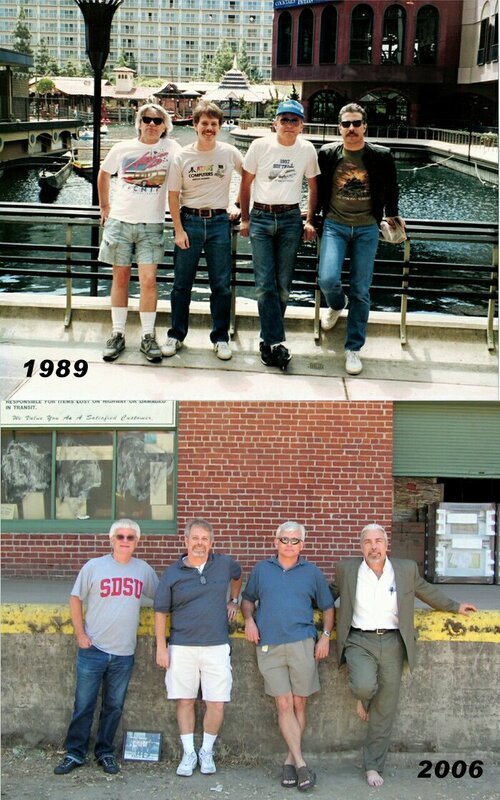 The top photo was taken in 1989 at the lagoon of the Disneyland Hotel in Anaheim. Our kids were in pre- or grade school, our hair had color in it and we were playing softball, soccer, etc. We were thinking about the direction of our careers. Seventeen years later, we met for lunch and took an updated photo. Now our hair is graying, our kids are in college or graduated, we talk about knee surgery and our own retirement. A lot can happen in 17 years. The one constant thing is the friendship. And when it comes to the friendship, seventeen years is just a drop in the bucket.